We are Hayes & English Funeral Directors in Hoxton, and you can depend on us to arrange and conduct a beautiful service that will celebrate your loved one's life in a way that is personal and meaningful to family and friends. 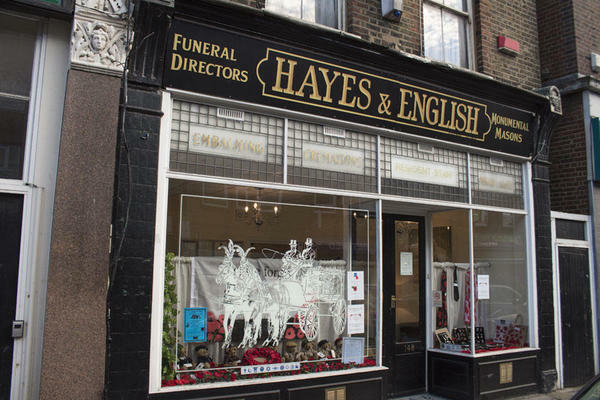 Our founders, the Hayes family and the English family, were both renowned and respected funeral directors in the London community when they joined in the twentieth century to form Hayes & English. From our beautiful array of floral tributes, to our immaculate memorial masonry, everything that we will provide for your loved one's farewell will be of unparalleled standards, because we understand how important it is to get things right. We can tailor every detail to meet any requests you have, catering for funerals of all religious, non-religious and alternative themes. We also have a chapel dedicated to “Our Lady of Victory”, which you are welcome to use if you would like to spend time with your loved one in peace, comfort and solitude. We are honoured to serve all Roman Catholic communities, particularly the Maltese community. We are always here for you, no matter what. Please give us a call at any hour; we are able to talk 24 hours a day. Call us today on 020 7739 9165 to talk through your personal requirements. At Hayes & English Funeral Directors, we understand how special life is with those that you love. For us, every funeral is unique and personal. We have a service to fulfil every wish, with every detail carried out with the same uncompromising quality of care. From a traditional service, to a colourful woodland burial, your options are limitless with our Full Service Funeral. If you have a little more flexibility when it comes to arrangements, then we can provide a Simple Funeral for a lower cost. There is pay & display parking on surrounding streets. You can find us next to The Hoxton Trust Community Garden. Our staff are available 24 hours a day on 020 7739 9165 if you require our services outside of these hours.